But what if you aren’t sure what that is? What if you have so many interests and none of them are things that will pay the bills? Elizabeth Gilbert, author of Eat, Pray, Love, spoke at Oprah’s “The Life You Want Weekend,” in September. For those of you who have not read the book, she wrote about reaching a point in her life where her marriage had ended and she was searching for fulfillment. In doing so, she traveled to Italy, India and Indonesia and found food, prayer and love. Yet, her response to the follow your passion advice was interesting and unexpected. She points out that even writers and creatives can’t possibly feel passion every day. But what they can feel is curious. You can watch the video here on Huffington Post. I have her TedTalk saved in my favorites so I can watch it whenever I feel lost. 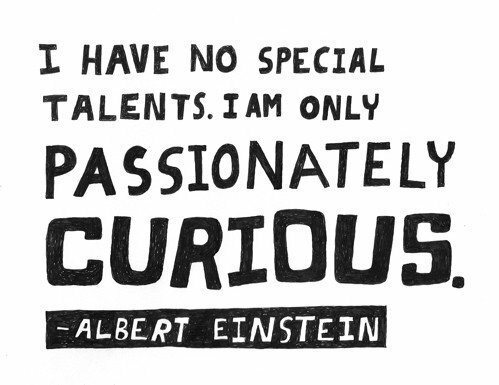 😊 yes, curiosity seems much more sustainable!